Contemporary and comfortable, the King Room features floor to ceiling windows overlooking green surrounds. The King Room provides the perfect option for overnight or multiple night stays. With an extended lounge area, feather & down topper for the perfect nights sleep, this spacious room is for those wanting a touch of luxury. Whether your stay is for business or leisure the Corner Suite offers touchpoints that will enhance your stay in every way. The Sky Penthouse offers multi-level luxury providing a living area, two expansive bedrooms with their own bathrooms and a deep soaking bath. 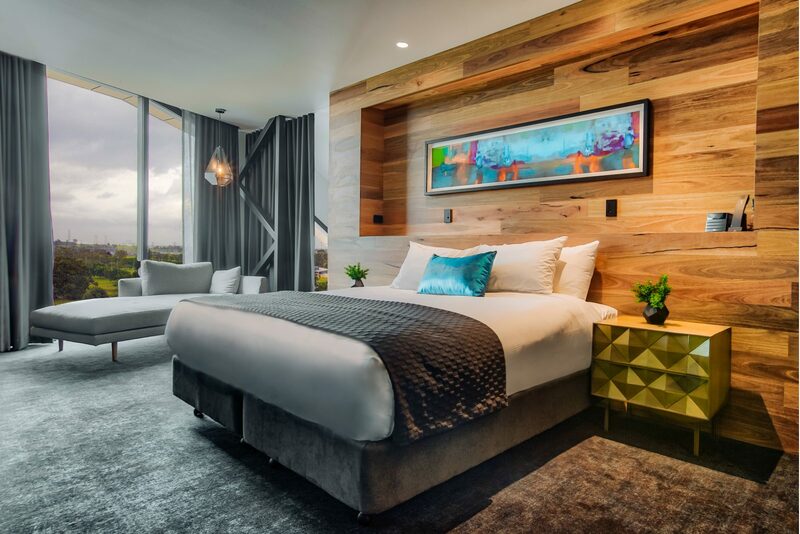 Eatons Hill Hotel Accommodation is a short 25 minutes from Brisbane airport and the CBD, and is adjacent to Brendale, one of the largest industrial estates in Queensland, and popular tourist locations - Samford and Dayboro. Stay only 15 minutes from Brisbane Entertainment Centre. Group Accommodation rates also available. Enquire Today! Nearby: Albany Creek Memorial Park, Pinnaroo Cemetery & Crematorium, Northwest Private Hospital, Prince Charles Hospital, Lawnton Cemetery, Topiaries, Glengarith Historic Estate and Sandstone Point Hotel. Accessible rooms are available and designed for comfortable wheelchair access including bathroom features to allow easy shower access.